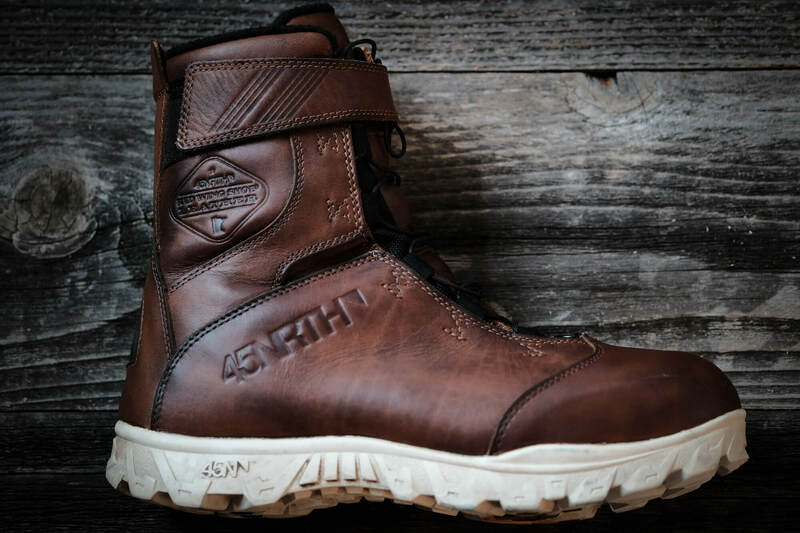 What makes the 45NRTH x Red Wing Wölvhammer unique is the Cedar Clovis 100% full grain leather used on the upper. Full grain leather is like skin: it needs regular care and conditioning. 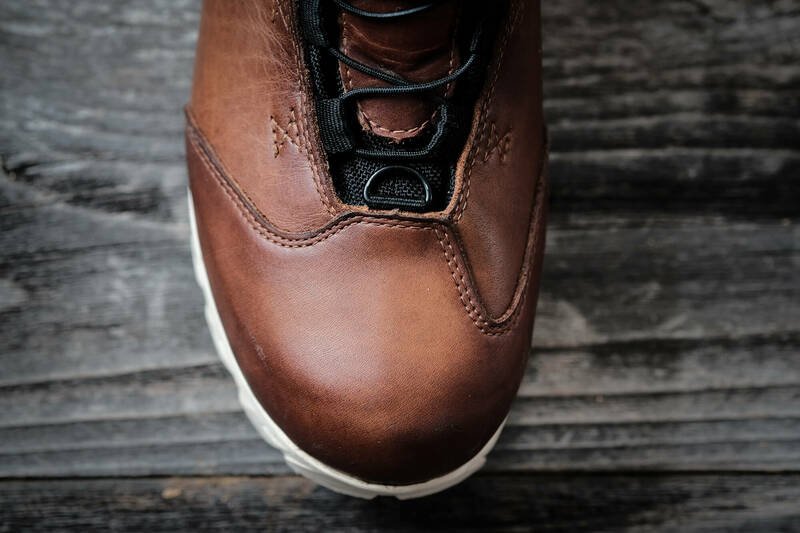 Not only does this help preserve the health and integrity of the leather, it brings out the unique aesthetic quality only possible with a full grain leather. 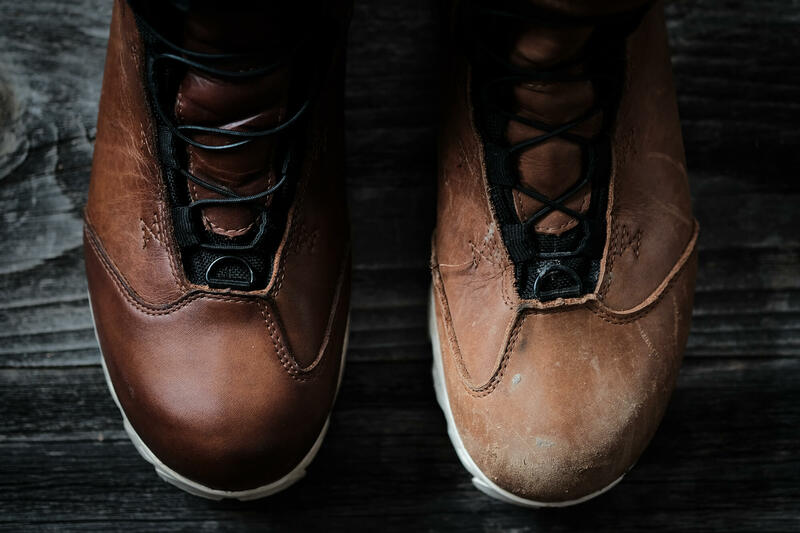 Over time, a full grain leather boot will truly become “your own” as it takes on the shape of your foot. 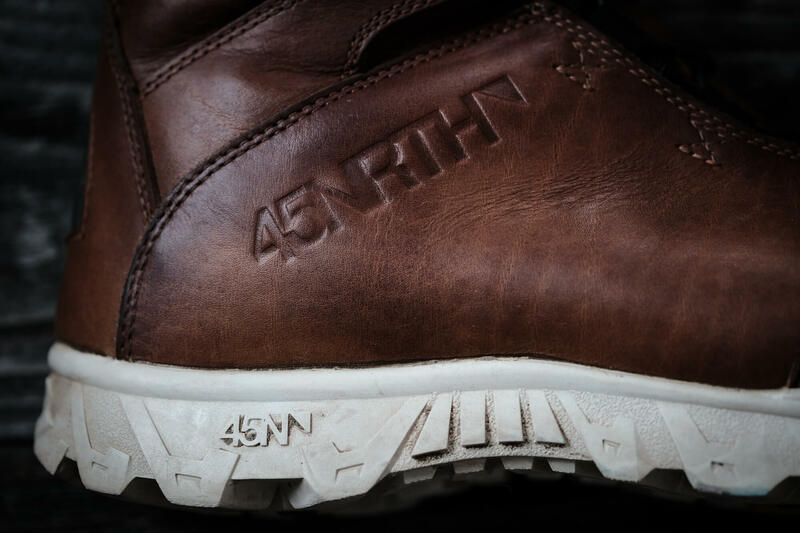 Here is a simple guide on how to care for your 45NRTH x Red Wing Wölvhammer boots. 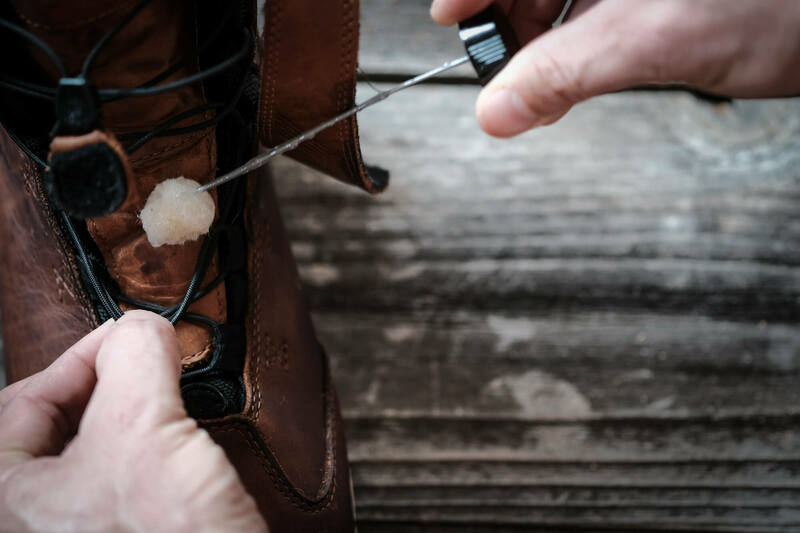 To start, you will need to gather your boots, a soft towel, horse hair brush, Red Wing Naturseal, Leather Protector, and a small bowl of warm water. Open up the laces so the tongue of the boot is free. You will see that my well-used boots have some scuffs, dirt and residue on them. The color is also lighter in areas where there has been abrasion. 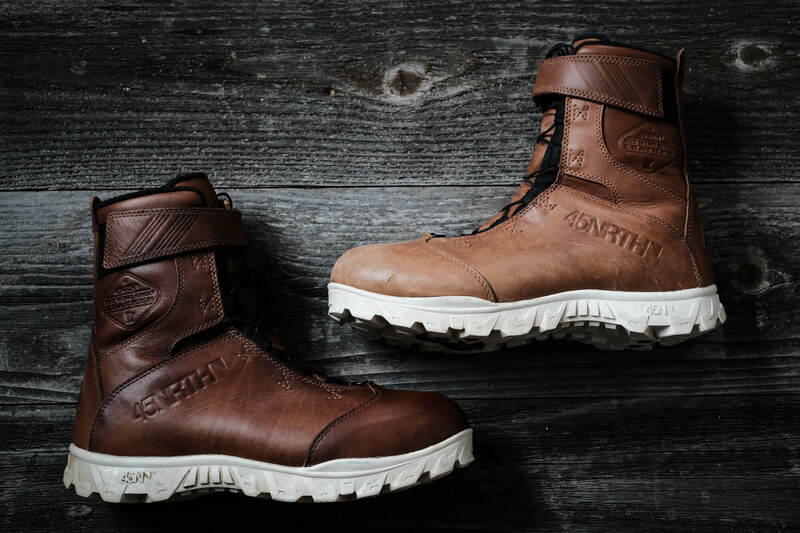 When your boots take on a light color with dull finish, the leather is telling you it needs conditioning. 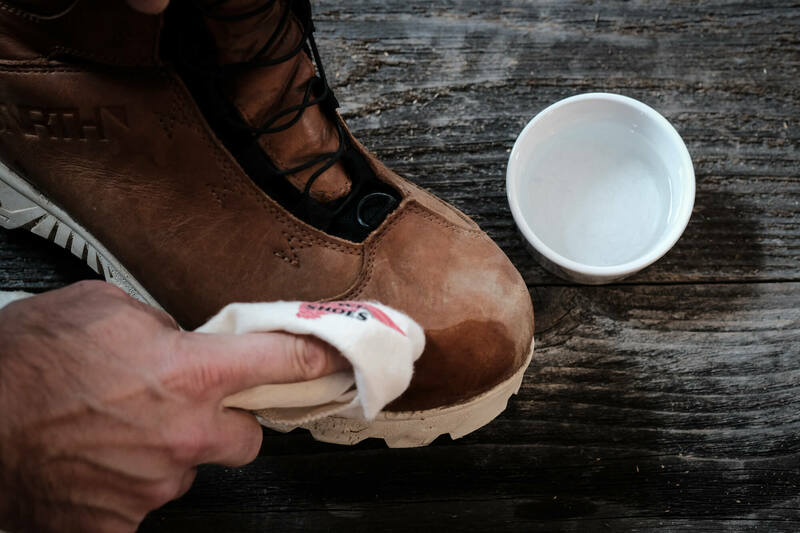 There are three basic steps in caring for your boots: cleaning, conditioning, and protecting. Start by cleaning off as much dirt and residue as possible with the horse hair brush. This removes large dirt particles from the surface of the leather. Dry mud will fall off easily. 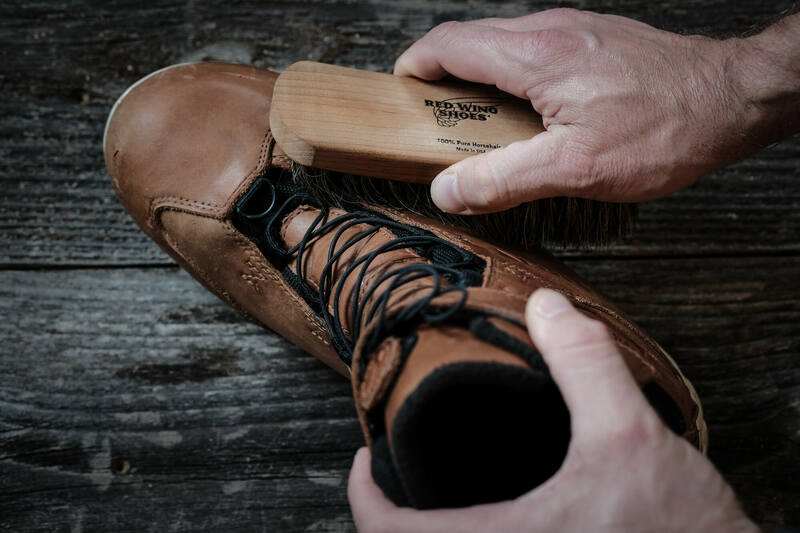 If your boots are really caked with thick mud, use a brush with nylon bristles and gently whisk away the dirt. Next, take a soft towel and wipe down the surface of the leather with warm water. 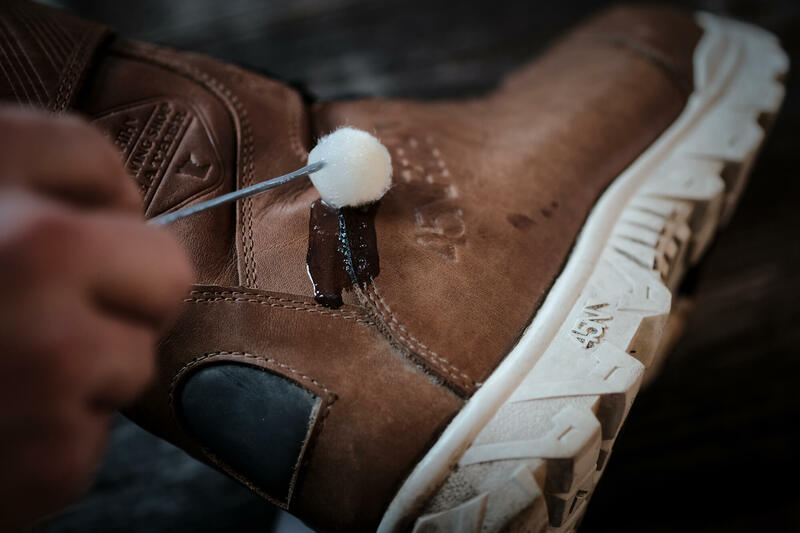 Be sure to clean all surfaces of the leather, including the overlay on the tongue and behind the laces. 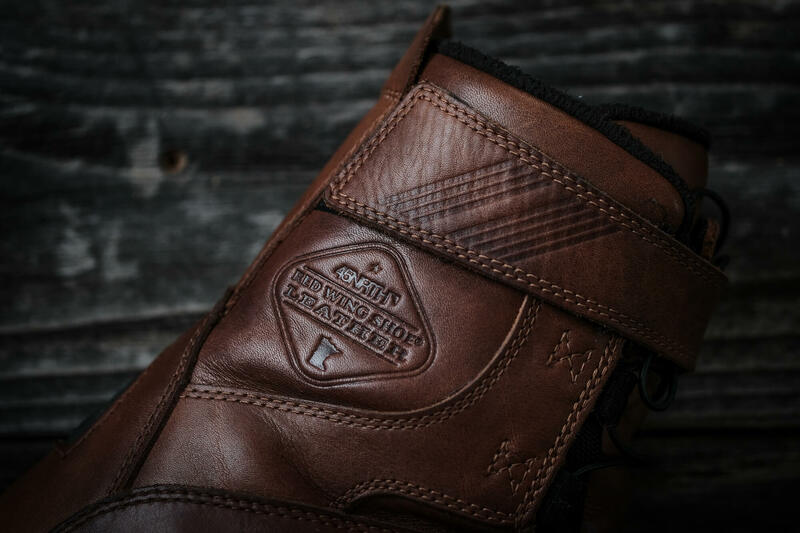 This process removes smaller dust particles and contaminants, providing greater access to the pores and deep fibers of the leather. Let the boots dry for 30 minutes. Once the boots are dry, begin the conditioning process by brushing on the Naturseal conditioner. Naturseal is specifically designed for waterproof leather, as it deeply penetrates the fibers, keeping the leather pliable and breathable. WARNING: using Naturseal will darken the color of the leather. However, after a few uses the color of the leather will gradually soften again, bringing out the beautiful nuances of full grain. Be sure to also treat the underlay behind the laces. All leather surfaces need conditioning. 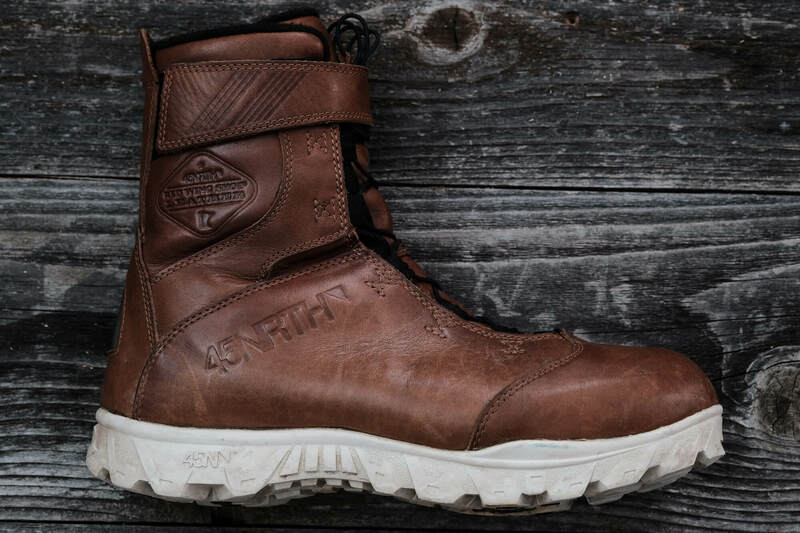 Right after applying the Naturseal you will see the boot in its darkest form, as pictured above. The marbling character of the leather can be seen dramatically as the conditioner begins saturating into the fibers of the leather. ​After a few rides, the leather will begin to gradually lighten again. The picture above shows the boot after 2 rides, and 5 days of absorbing the Naturseal. 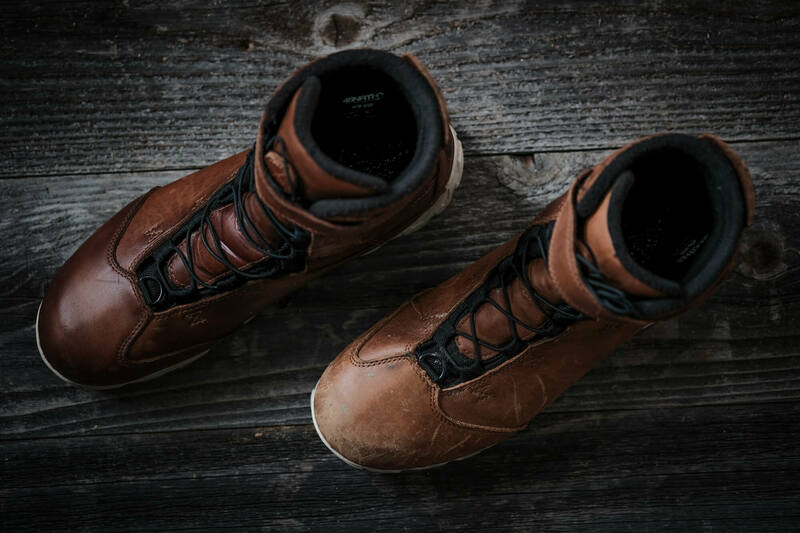 Conditioning is not only healthy for the full grain leather, it cleans up scuffs and small abrasions to bring the visual quality of the leather back. The boot on the left looked the same as the boot on the right before conditioning. The results are immediately noticeable. 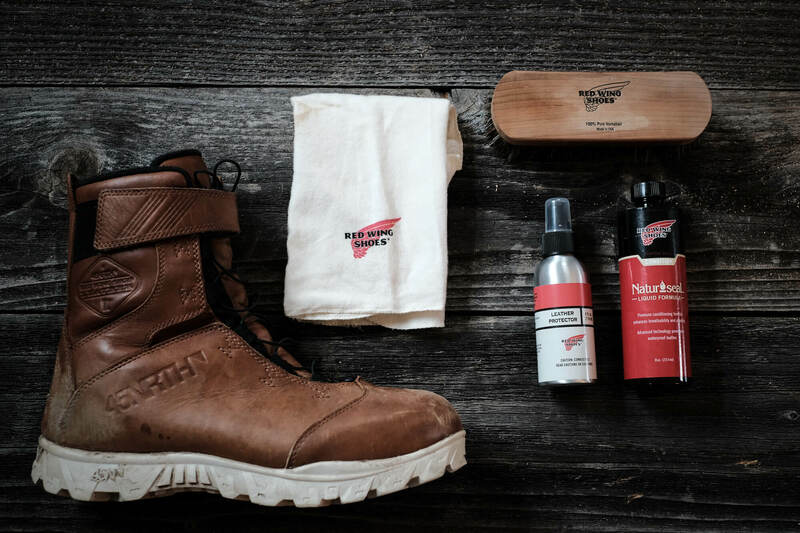 The last, and very important step is to protect the leather with Red Wing’s Leather Protector. Hold the spray bottle about 8 inches away from the leather and spray evenly and thoroughly. 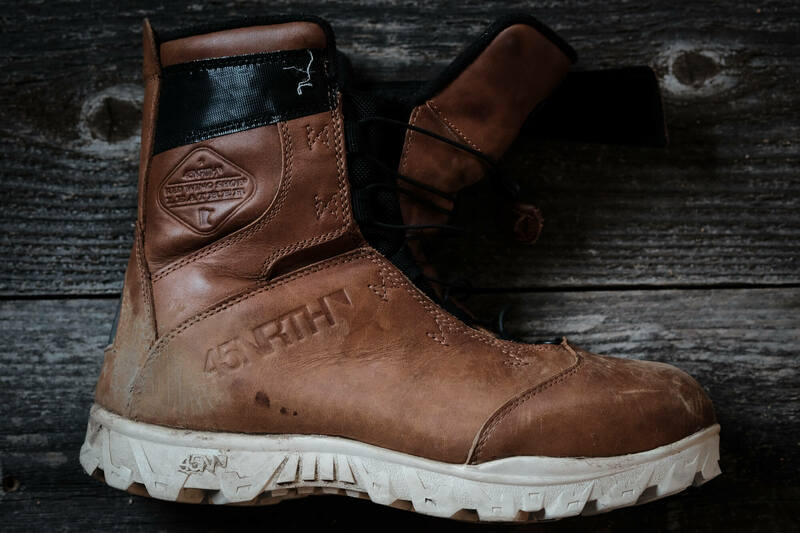 The protector acts similarly to a durable waterproof repellent (DWR) treatment, preventing water, salt and other grime from entering the leather fibers. A well conditioned boot will have a slight shine and radiance to it, like the boot picture above on the left. The boot on the right is a bit dry and needs conditioning. 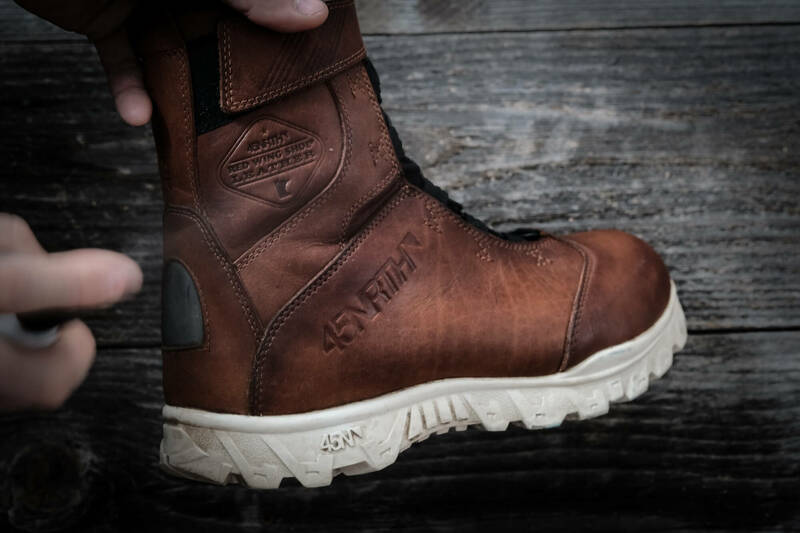 The boots will be at their darkest right after conditioning, and after your first few rides the color will begin slowly lightening as the conditioner soaks in and the exterior is exposed to the elements again. Over a more extended period of time, you will notice the shine and deep tone of the leather begin to fade. When the leather starts looking very dry, it is time to clean, condition and protect the leather again. Happy trails!